SUCI UTAMI - Productive Housewife: My cardigan made from my bedsheets? My cardigan made from my bedsheets? This is very funny, unintentionally cardigan I was wearing looks similar to sheets in our bedroom. Wow! really identical..
and this is what I wore today! 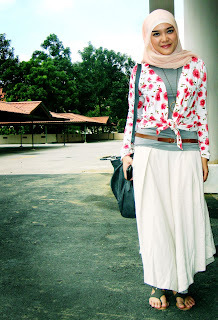 what I wore: Cardigan from my bedsheets (just kidding! :p) this is Cotton On cardigan, VNC gladiator sandals, and the rest unbranded! viva unbranded! LOL! Thank God nobody noticed that, but now I tell the whole world through my blog! Great. LOL again!